In the last couple weeks our farm boxes have included a “braising mix,” a blend of young kale leaves, leafy fennel, baby Swiss Chard and a bit of green onions or chives. As kale is among my favorite leafy greens, I really enjoy the nuttiness of this intended-to-be-stir-fried mix. I just use a bit of coconut oil chipped into the sauté pan and dump the whole bag right on top. (I’m currently using an unrefined, virgin coconut oil that is certified organic.) Interestingly, the oil is liquid at room temperature, but is harder than butter right out of the fridge. I keep mine refrigerated. 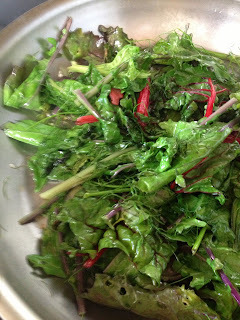 Anyway, heat until sizzling, and the greens are wilted and tender. The coconut oil lends a subtle, sweet tropical taste to the finish to which I add slivered kumquats, flicking out the seeds as I go. As I’ve said before, cooking brings out the complex flavors of kumquats, so don’t give up on them if you’ve only eaten them raw. I served this with a steamed brown rice and found the meal quite filling.